Scarcity is always a problem, not just in preschools, but everywhere. The big difference is that in our preschool, thankfully, scarcity isn't an issue when it comes to necessities, only with those like-to-have-but-can-live-without items like old rowing machines and giant plastic insects. When I first started teaching we spent a lot of time trying to help children hammer out sharing and turn-taking agreements, often involving me or another adult serving as the time-keeper, or otherwise managing things, and still, when the time was up, there remained many kids tearily reluctant to stick with the bargain, taking us back to square one in which an adult more or less has to force matters. And honestly, it always stuck in my craw that even these dodgy solutions took so much adult intervention. I like the books of Robert Munsch, mainly because he is a storyteller first, and they are structured so that it's easy to borrow his stories like Stephanie's Ponytail, Murmel, Murmel, Murmel, and The Paper Bag Princess, and make them into my own oral stories. One story, however, that I could never make my own was the book We Share Everything, in which the kids wind up making a mockery of the adult mantra that was the book's title. I mean, that's kind of how we were doing things at Woodland Park and I couldn't bring myself to reveal the flaws in our system. It was the advent of the 2-seat swing set, I think, a couple years ago that lead me to rethinking the whole idea. At the time, there always in seemed a kerfuffle over the swings. Children would whine, "She's not giving me a turn!" One day, probably because I was distracted with something else, I responded, "She's using the swing now. When she's done, it will be your turn." I then said to the girl swinging, "When you're finished swinging Sophia wants a turn." Minutes later, when I looked up, there was Sophia getting her turn. There are still individual parent-teachers who manufacture sharing solutions for the kids, especially around the swings, and when something new is introduced (like our slot-car track with only two-tracks) the adults still need to manage a system, but when it comes to day-to-day sharing and turn-taking, I've more or less stopped trying to help. When a child complains to me about "turns" or "sharing," I now generally just point out the facts: "Johnny is using it now, when he's done it will be your turn," making sure that Johnny hears me say it, sometimes, even confirming with him, "When you're done, Johnny, Suzy wants a turn." It doesn't always result in Johnny doing the right thing, but most of the time it does. In fact, very often Johnny voluntarily ends his turn far sooner than he would have had I been there compelling it. But, as is true with anything we adults turn over to the kids, they are often far more inventive when it comes to solving their problems if we give them that space, even when scarcity is involved. For instance, my parents are moving into a smaller place, and they had a rowing machine that was too old to even sell, so I decided to try plopping it down in the outdoor classroom, with the idea being that if the kids don't play with it, we can at least dismantle it bolt by bolt at the workbench. It's not been as popular as the swings, but on any given day, children will play with it, often using it as a space ship. 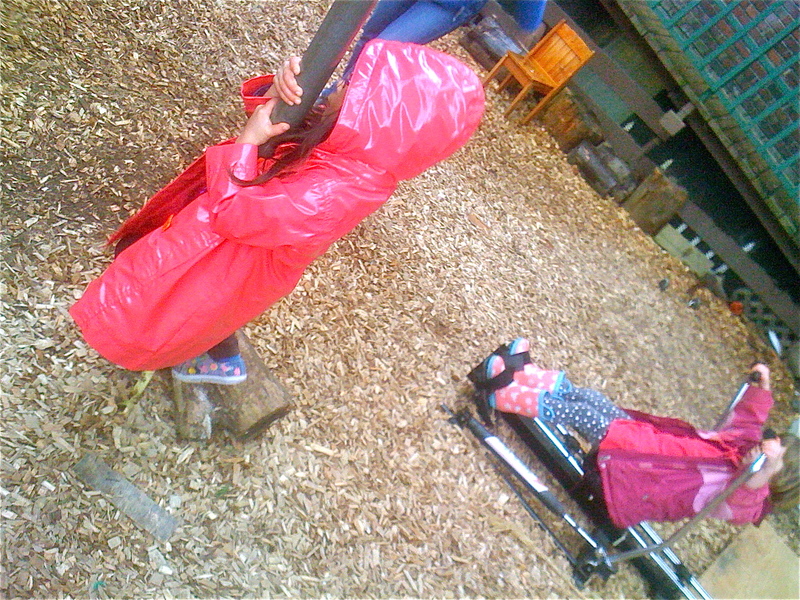 A few days ago, I noticed Lily standing on a log, her harms wrapped around one of the uprights of the swing set. She looked either bored or melancholy, so I thought I'd check in. I said, "I looks like you're just hanging around." "I'm having my turn standing on the log." I was confused, especially since there was an empty swing seat. "Are you waiting for a swing? I see an empty one right there." "No, it's my turn to be on the log." Still confused, I asked, "Do I get a turn next?" "No, it's Hazel's turn next." I spotted Hazel several steps away, struggling with the rowing machine. "Is Hazel waiting for her turn to stand on the log?" "No, she's having her turn on the machine." 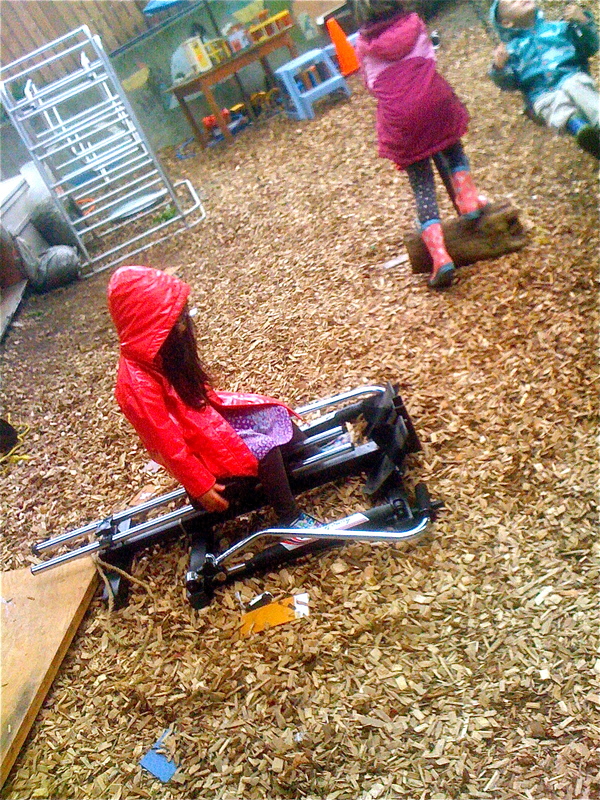 With that, Lily stepped off the log and went over to Hazel. Without a word between them, Hazel stopped rowing and gave up her place. As Lily began to row, Hazel stepped up on the log and wrapped her arms around the pole. They continued this sort of wordless trading of places for several rounds as I watched. Or how about our giant plastic insect solution? 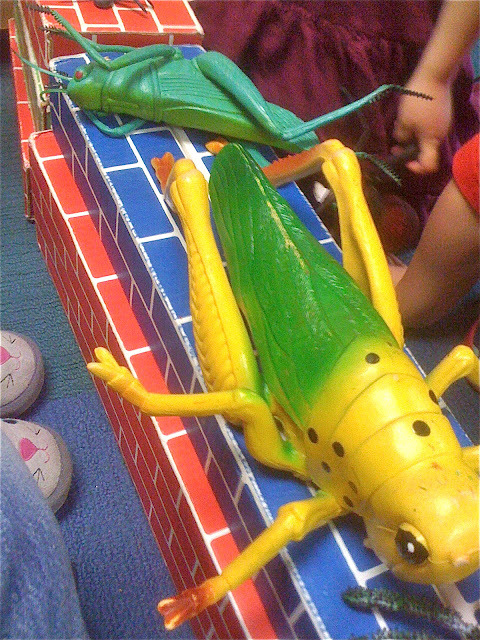 We have a collection of these large insects. There are a couple dozen of them. They're all popular playthings, but there are some that are more sought after than others. 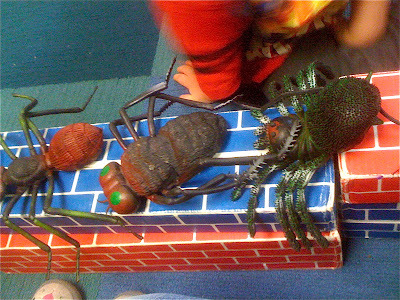 Typically, when we have them out, we have to deal with the problem of hoarding, a word that I've introduced to the children to describe the phenomenon of a child collecting the bugs (or whatever) and not playing with them, but rather just preventing others from playing with them. When I arrived on the scene, Marit was the only child playing with the bugs. She had lined them up along the top of a block, side-by-side. Thinking I detected the beginnings of a hoarding situation, I said, "You have all the bugs." "No I don't," she answered, "There are some over there," pointing to a collection of smaller, less desirable insects. "This is my store. I'm selling bugs." "You can buy anyone you want except the bee. That's my pet." "I'd like the scorpion." I picked up my merchandise and pretended to hand her money. "No, you have to use the money over there," again pointing to the other insects. "I'm pretending that the other bugs are the money." I handed her a small rubber spider, a clearly less attractive bug, and she gladly turned over the scorpion no questions asked. Before long, other kids joined us and Marit had a booming barter business going. She made no distinction between larger bugs and smaller, desirable and undesirable: everything was a one-for-one transaction. Soon Rex had joined her as a shop keeper. For the rest of the week, we played with those bugs, always with someone or a group of kids operating a "bug store," and not once did we have to deal with hoarding. Not once did scarcity cause us to whine. It was the kind of beautiful we're-all-in-this-together solution that only a child could contrive.